The Organisation for the Prohibition of Chemical Weapons, the body overseeing the destruction of Syria’s chemical arsenal, has won the Nobel Peace Prize. The Nobel Committee said it was in honour of the OPCW’s “extensive work to eliminate chemical weapons”. The OPCW, based in The Hague, was established to enforce the 1997 Chemical Weapons Convention. OPCW director general Ahmet Uzumcu said the award was a “great honour” and would spur it on in its work. He said the deployment of chemical weapons in Syria had been a “tragic reminder that there remains much work to be done”. The OPCW recently sent inspectors to oversee the dismantling of Syria’s stockpile of chemical weapons. It is the first time OPCW inspectors have worked in an active war zone. The watchdog picks up a gold medal and 8m Swedish kronor ($1.25m; £780,000) as winner of the most coveted of the Nobel honours. The OPCW has been working to rid the world of chemical weapons for the past 16 years. For the most part, this task has been laborious and unheralded. A staff of about 500, working from its headquarters at The Hague, is charged with making sure that the 189 signatories to the Chemical Weapons Convention are abiding by its terms. But it is only in recent weeks, following the use of chemical weapons in Syria, that the OPCW has become a household name. It is facing its biggest challenge ever – to verify and destroy Syria’s entire chemical weapons programme by the middle of next year. The Nobel committee clearly feels it needs all the support it can get. It is not uncommon for organisations to be awarded the Nobel Peace Prize. It has happened 24 times since 1901. Non-proliferation has been an occasional theme, with campaigners for nuclear disarmament and against land mines among those recognised. UN Secretary General Ban Ki-moon praised the award, saying the OPCW had “greatly strengthened the rule of law in the field of disarmament and non-proliferation”. Announcing the award in Oslo, Norwegian Nobel Committee chairman Thorbjoern Jagland said it wanted to recognise the OPCW’s “extensive work”. “The conventions and the work of the OPCW have defined the use of chemical weapons as a taboo under international law,” he said. 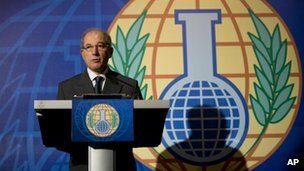 The OPCW’s Ahmet Uzumcu said the organisation had been working “with quiet determination to rid the world of these heinous weapons”, away from the spotlight, for the past 16 years. He said the Syria mission was the first time the OPCW had worked to such a short timeframe and in an ongoing conflict, and that it was “conscious of the enormous trust” placed on it by the international community. Praising the commitment of his staff and the support of member states, he said the Nobel Peace Prize would “spur us to untiring effort, even stronger commitment and greater dedication” to bring about a world free of chemical weapons”. The OPCW is made up of 189 member states and the principal role of its 500-strong staff is to monitor and destroy all existing chemical weapons. It draws on a network of some of the best laboratories and scientists in the world to help it in its work, the BBC’s science correspondent Pallab Ghosh says. The 1993 Chemical Weapons Convention has contributed to the destruction of nearly 80% of the world’s chemical weapons stockpile.Syria is expected to sign the treaty in the coming days. French President Francois Hollande said the Nobel prize was a “vindication” of the international efforts in Syria and pledged continued support for the OPCW’s work there and elsewhere. US Secretary of State John Kerry said the “Nobel Committee has rightly recognised [the OPCW’s] bravery and resolve”. European Commission chief Jose Manuel Barroso, EU President Herman Van Rompuy and German Chancellor Angela Merkel all congratulated the OPCW.There were a record 259 nominees for this year’s Peace Prize, but the list remains a secret. Pakistani schoolgirl campaigner Malala Yousafzai and gynaecologist Denis Mukwege of the Democratic Republic of Congo had been tipped as favourites to take the award. Others who had been listed as contenders were Chelsea Manning (formerly Bradley Manning), the US soldier convicted of giving classified documents to Wikileaks and Maggie Gobran, an Egyptian computer scientist who abandoned her academic career to become a Coptic Christian nun and founded the charity Stephen’s Children. But an hour before Friday’s announcement, NRK reported the award would go to the OPCW. The European Union won the prize in 2012 in recognition of its contribution to peace and reconciliation, democracy and human rights in Europe. Previous Nobel Peace Prize laureates include anti-apartheid hero Nelson Mandela, US President Barack Obama, the Dalai Lama and Burmese opposition leader Aung San Suu Kyi.